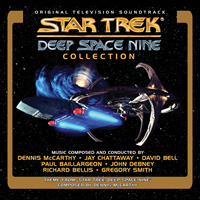 La-La Land Records proudly announces its forthcoming release of STAR TREK: DEEP SPACE NINE COLLECTION, a limited edition 4-CD soundtrack set that showcases musical highlights from episode scores as heard in all seven original seasons of the beloved sci-fi television series STAR TREK: DEEP SPACE NINE (1993-1999). This special collection of music features more than five hours of incredible score, selected from some of the most acclaimed episodes of this enormously successful NEXT GENERATION spin-off. Produced by Ford A. Thaxton, James Nelson, Mark Banning and Lukas Kendall, and mastered by James Nelson, this deluxe, limited-edition release of 3000 units chronicles its music on four CDs – The first disc features the music of composer Dennis McCarthy; the second disc features the music of composer Jay Chattaway; the third disc showcases music from “the new recruits,” composers John Debney, David Bell, Richard Bellis, Gregory Smith and Paul Baillargeon; and the fourth disc, entitled “The Lost Album,” contains an album assembly of material that was prepped by music producers and the composers for a soundtrack compilation that was never released. The set is complemented by a 36-page booklet that includes exclusive, in-depth liner notes from film music writer and Trek historian Jeff Bond.